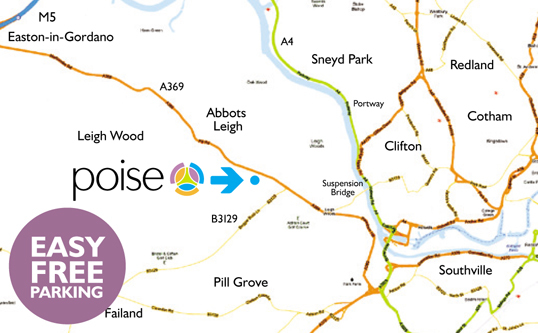 The services of the Poise Health Team are based in Bristol providing treatment, advice and exercise programmes to help you be ‘healthwise’ when it comes to looking after you, your spine and your whole body. Reducing the chance of injury and helping in your recovery from painful conditions following acute sudden injuries, long term chronic pain and back pain with or without leg symptoms. Other conditions that physical therapy can help are listed below. Physical therapy such as chiropractic, physiotherapy, osteopathy and massage therapy are all beneficial for the treatment of painful conditions of the joints, ligaments, muscles, tendons and nerves of the body and spine. A treatment plan combined with exercise, flexibility and core strength training is generally the most effective. Our team of professionals are here to work with you and ensure the best treatment plan to speed your recovery and ensure it is long-lasting. If you want to find out more about your own condition, you can book a consultation and get fully assessed, call 0117 244 3344 or email leizaalpass@me.com. Traumatic onset injuries such as an ankle sprain or neck, shoulder and arm pain following an accident. Poise Health has been awarded The Royal College of Chiropractors Patient Partnership Quality Mark. Your Professional will provide you with a thorough consultation and examination to diagnose your problem and the cause of any pain or problems you are experiencing. Your condition and diagnosis will be fully explained to you and the treatment plan recommended for your particular condition. When possible, your treatment will commence on your first visit. Most people with mechanical joint pain such as lower back pain find that within 4 to 6 treatment sessions, they will experience good positive improvements with their condition. Other conditions vary depending on the length of time the problem has been there and the cause of the condition. You will be advised of the likely number of sessions for your condition following your consultation and examination. Your treatment plan will include both ‘hands-on’ care followed up with specific stretches, sound advice and exercise routines to help you make a full and long-lasting recovery. Call 0117 244 3344 to make an appointment at a time to suit you. You may also book online by clicking the icon above. Who are the Poise Health Team of Professionals? We are healthcare professionals working with people in the Bristol and surrounding area with all sorts of painful musculoskeletal conditions. Leiza Alpass MSc DC, Chiropractor, Bristol with over 15 years of experience helps people of all walks of life with all sorts of painful conditions from chronic back pain, acute sports injuries, postural pain, repetitive strain injuries, ‘whiplash’ related injury to pelvic pain during pregnancy. Here is a short clip of testimonials from patients who have received chiropractic care from Leiza. Kate Stuart, Sports Massage Therapist, Bristol. Kate’s passion is helping others keep doing what they want to do. She works with you to establish the cause of the problem, the treatment options and provides rehabilitation exercises to prevent further injury developing.